AgroAtlas - Crops - Ribes aureum Pursh - Golden currant. Ribes aureum Pursh - Golden currant. Family Grossulariaceae DC., genus Ribes L.
Ribes flavum Berl., R. tenuifolium Lindl., Chrysobotrya lindleyana Spach. 2n=16. Shrub up to 3 m, with red-brown naked or fine downy shoots; the cortex darken with age. Leaves are orbicular, 5 cm length and 6 cm width, with 3 deep blunt laminas and wedge-shaped base, naked; in autumn the leaves painting in bright purple colour. Inflorescence - raceme 3-7 cm length, with 5-15 fragrant flowers, which have large bracts. Calyx golden-yellow, petals orange-red, golden. Mature berries is spherical, 10-12 mm (up to 18 mm) diameter; colour yellow (different shades), orange, red, black, brown; with 2-26 seeds. Average weight of one berry 0.5 g, maximum 1.0-1.1 g.
Native land is Rocky mountains on the west of North America. In Europe introduced with first half of 17 century; in Russia planted out in 1816 in Nikitsky botanical garden. In the former USSR cultivated in the European part, Caucasus, Middle Asia, south of Siberia and Far East. Can grow on the detritus, stony soils, on the outcrop of the fundamental rocks on the sides and bottom of the ravines, bear some salting of the soils. Easy bearable influence of the sharp-continental climate with hold winters and dry hot summers. R. aureum is the most drought-resisting species of the currant. The deep root system allows to endure drought easy, and the thick shining cuticle promote by small evaporation. Frost-resisting (bear the low temperature to -35°C by snow cover no more 20-30 cm). R. aureum have the flowers with long and narrow tube of the calyx and pollinated by long-proboscis bees and also by beetles, flies. Weak injure by pests and diseases. Smoke- and dust-resisting. Economic value and Agricultural technology. R. aureum have agromeliorative (soil-protection shrub) and decorative significance, used for inoculation of the high productivity sorts other species of the currant and gooseberry (especially in more soft climate zones). Berries contain up to 8.1% sugars, 0.9-1% organic acids, rich by ascorbin acid, vitamins of B group; yellow-orange berries - with vitamin A. Used for wine, jam. There are forms with sweet, sour-sweet and sour berries. 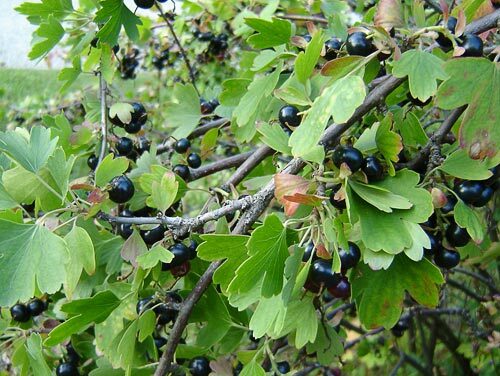 Productivity with adult shrub is 8-10 kg berries. The berries mature in the bunch extremely uneven. The best sorts are Venera, Ljaisan, Shaphak, Muskat, Izabella. Reproductive by first-year stem grafts, green grafts, segments of underground shoots, cuttings, division of the shrub. The grafts grow in the end of August - beginning of September. The distance between the lines of the grafts is 50-70 cm, distance between grafts in the line is 12-15 cm. Under-winter watering is necessary in dry autumn. Batalov V. V., Ignatev V. I. Berries cultures. Kucgesi, 2002. 144 p.
Culture flora of USSR / E. V. Vulf (ed.). Vol. 16. Berry. Moscow; Leningrad: Gosudarstvennoe izdatelstvo kolhoznoi i sovhoznoi literaturi, 1936. 285 p.
Efremova M. K., Lenskaja G. P. Catalogue (description of the sorts). Currant black, red, white, gooseberry. Moscow: Selskaja Nov, 1992. 71 p.
Novoselova T. G. Berry shrubs. Rostov-na-Donu: Feniks, 2003. 256 p.
Savel.eva L. S. Bear fruit of gold currant // Agromelioration. Bulletin of scientific-technical information. 1958. P. 85-88. Savel.eva L. S. Golden currant. Stalingrad: Stalingradskoe knizhnoe izdatelstvo, 1959. 24 p.
Trees and shrubs of USSR / S. J. Sokolov (ed.). Vol. 3. Moscow, Leningrad: Nauka, 1954. P. 784-800. Vitkovsky V. L. Fruit plants of the world. St.-Petersburg; Moscow; Krasnodar: Lan, 2003. 592 p.
© A.Ju. Doronina, N.V. Terekhina.